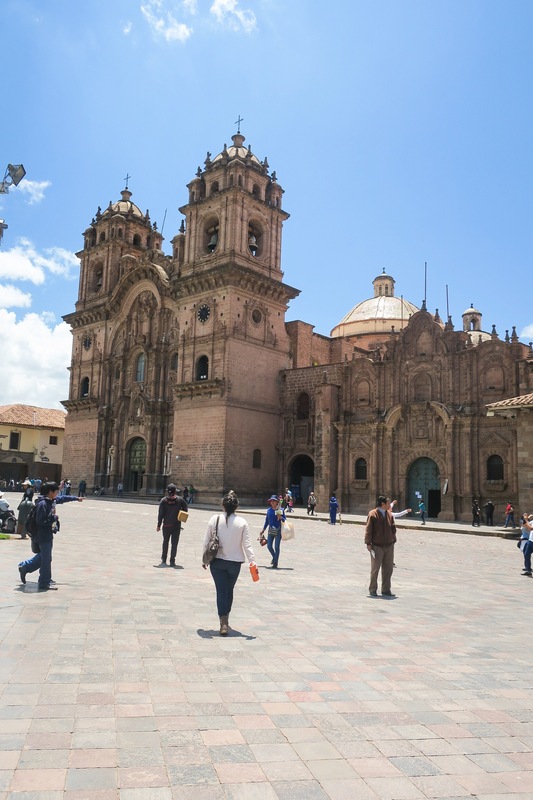 Before heading up to the glorious Machu Picchu we stayed in Cusco, the most common place to stay before heading up. It is recommended to take it easy your first few days to get used to the altitude, so we left ourselves with plenty of time there. You can feel the altitude almost immediately! 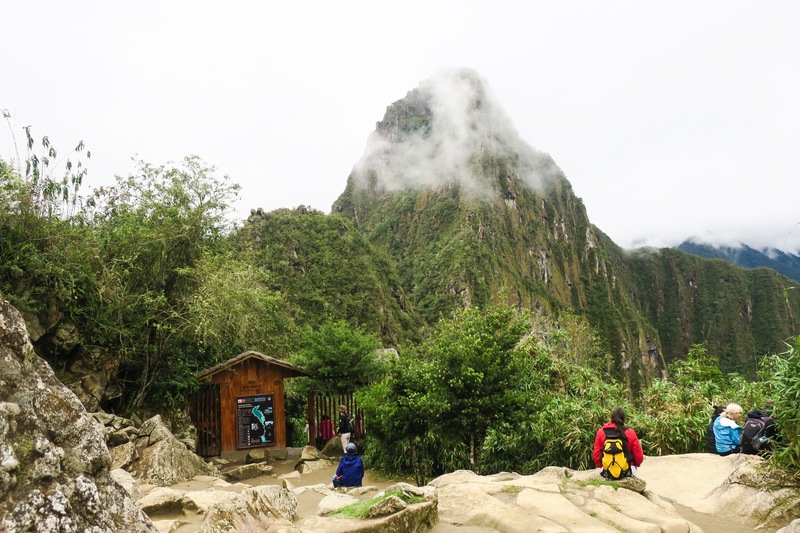 The elevation is 11,152′ so altitude sickness is common. Luckily, not being able to breathe as easily and not being able to walk long distances is all we had to deal with. 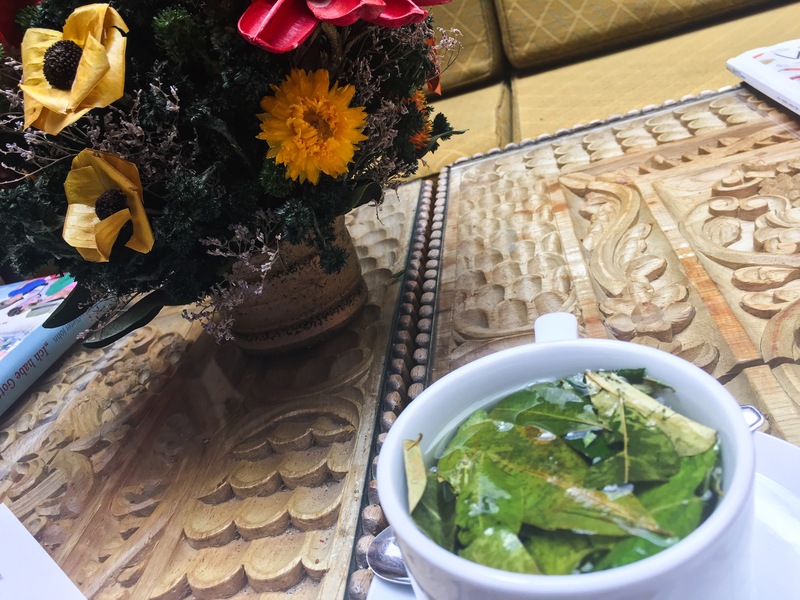 A common way to help with the altitude sickness is to chew coca leaves or have coca tea. Maybe that’s why we only minimal side effects! 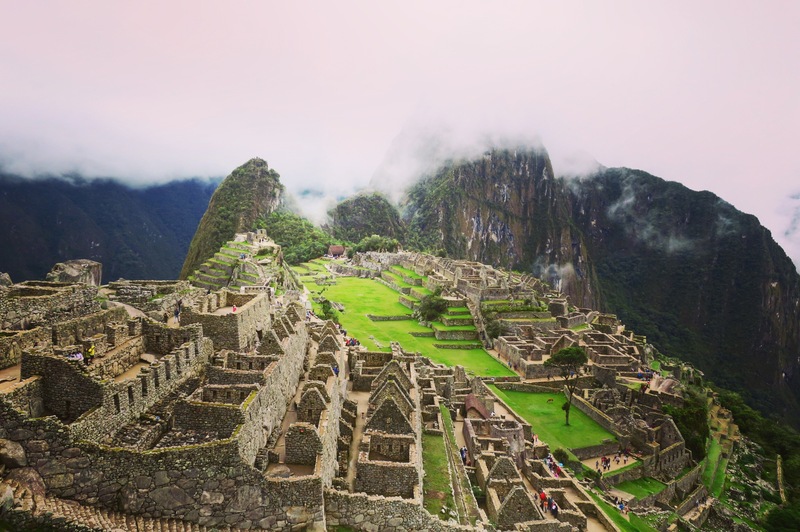 Fun fact – coca leaves used to be used to make Coca Cola! We got in around 1pm on the first day and just wandered around the town. It’s small enough to give that small town feel but big enough that you can keep exploring without seeing the same thing over and over. We stayed 2 blocks from the main square so we were immersed into the town very quickly. We spent our first afternoon relaxing, grabbing coffee and checking out the shops. Apparently they’re known for their massages here so we checked out a few of those places too. Everyone here is selling something. From hats to shawls, keychains, ponchos, art, you name it! 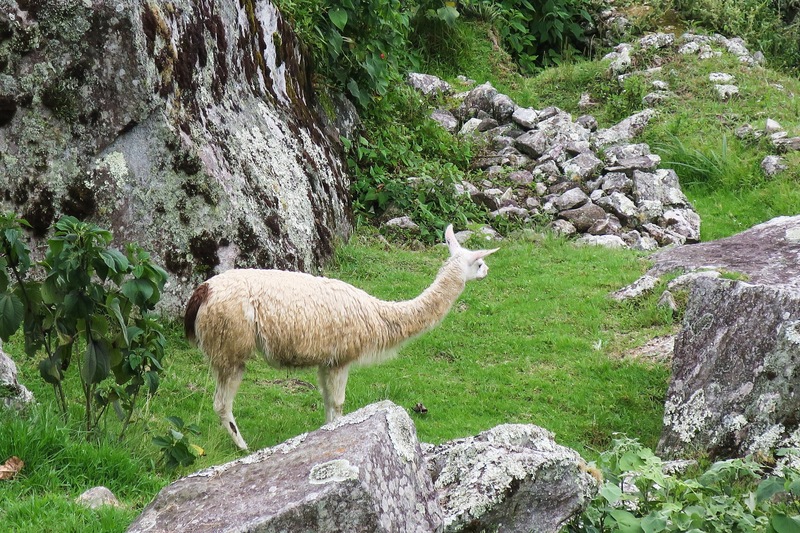 While looking for dinner we saw a few locals with their baby alpacas. 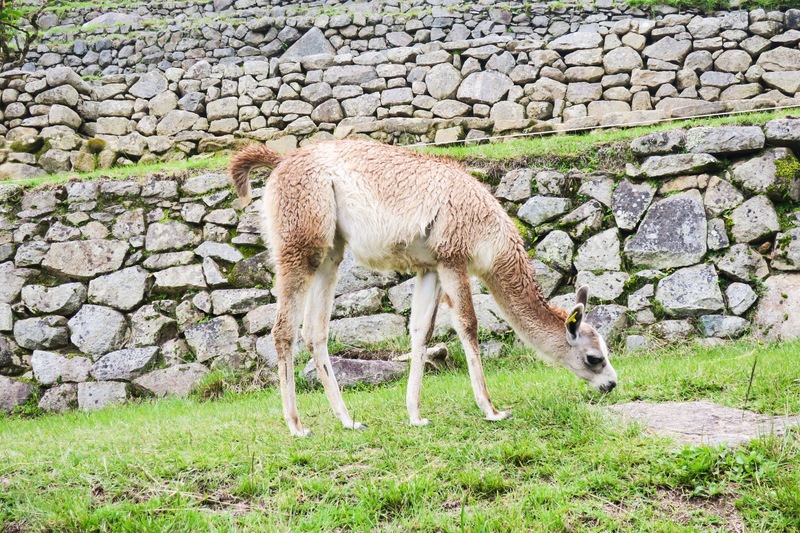 Clearly waiting for tourists to come up for a picture so they can make a few sol (Peruvian money). 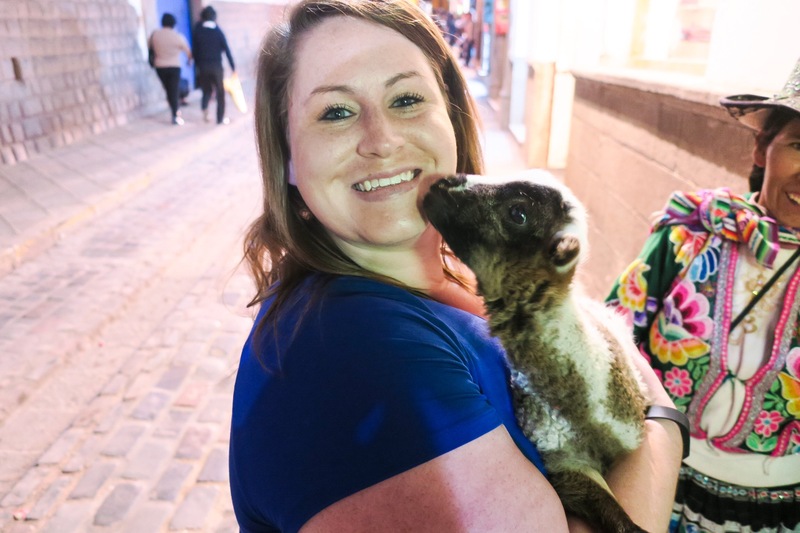 I went up to ask for a photo and the baby alpaca was quickly shoved into my arms without so much as a second thought. My heart melted!! Can we take it around the world with us and bring it home? 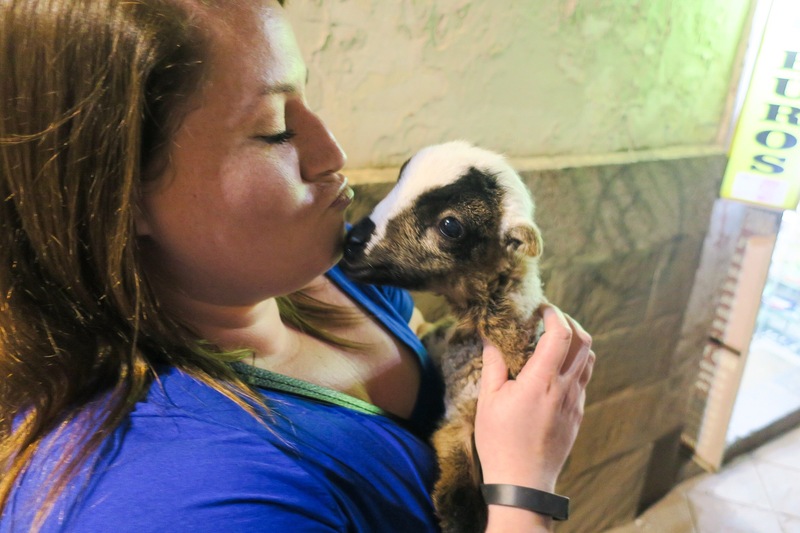 Never mind the little girl trying to pik pocket me while I held her baby alpaca… it was so awesome! Luckily I caught her and still have all my stuff! We had dinner at Papacho. This is a restaurant of the famous Peruvian chef, Gastón Acurio, we were excited to eat at one of his places and boy did it impress! It was the best dinner so far! It was classic Peruvian, a blend of Asian and Latin Flavors. 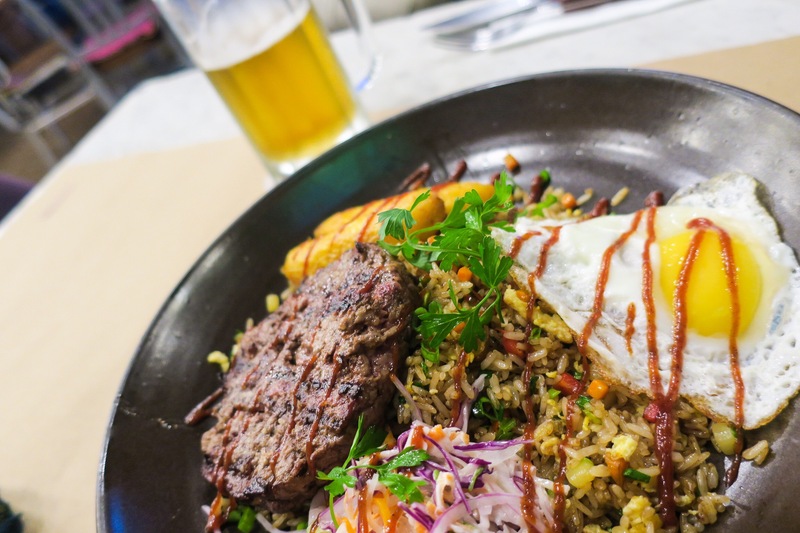 Dean got the Chaufa Burger, Peruvian fried rice with a medium rare flame grilled hamburger and perfectly cooked sunny side up egg on top with the nice addition of 2 grilled bananas. 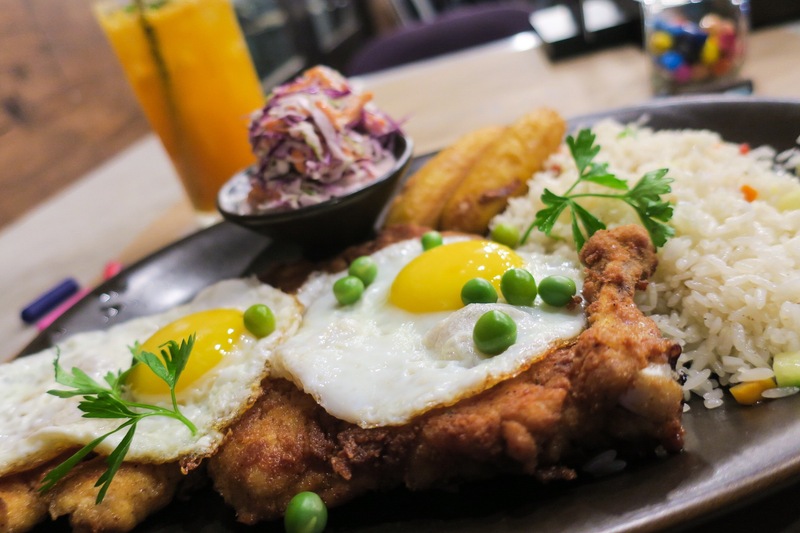 I got Captain Pollero, golden brown and crispy chicken cutlet with 2 runny yolk sunny side up eggs on top with a side of Peruvian rice and grilled bananas(Dean ate those too). Of course we needed drinks too, Dean got a typical Peruvian beer, I got the Te Tumbo, an amazing cocktail of Pisco, Tumbo juice, Passionfruit juice, ginger ale and a splash of mandarin juice. Dessert was well publicized, the top of the menu even said “all desserts in the world can be sundaes” We decided on the Alfajor which was their house made vanilla ice cream, chunks of alfajor cookies(a crumbly cookie with dulce de leche), more dulce de leche spooned ontop and a mound of creamy whipped cream. 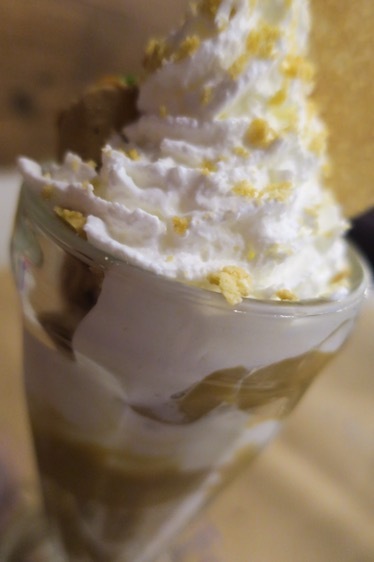 It was so creamy and the dulce de leche had the perfect caramel/butterscotch flavor. The best way to end a meal. We were told specifically that on our first full day we should do nothing but relax. So that’s what we did! We wandered around a bit but mostly just hung around. 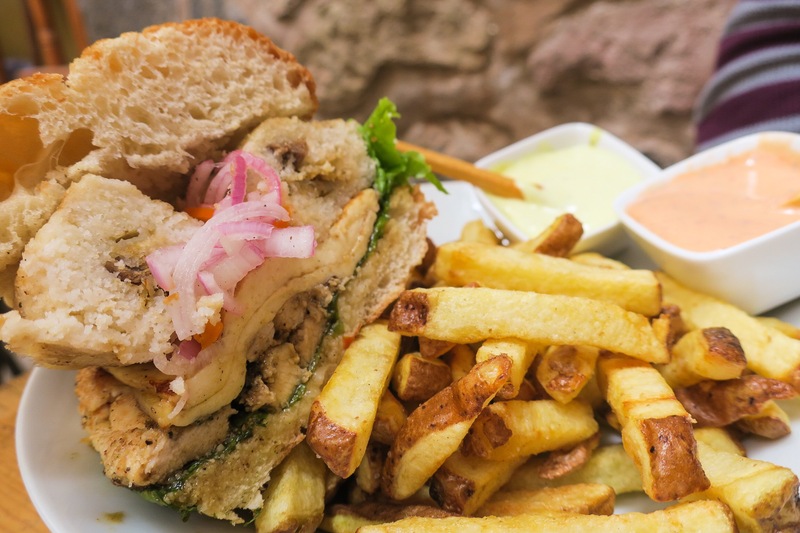 We got lunch at a sandwich place recommended by a friend who had been to Cusco and raved about it. It was called Juanitos and we would never have found it on our own so we were so happy she clued us in! 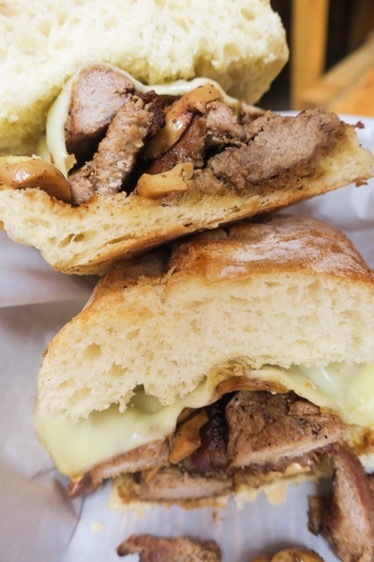 Dean decided it would be fun to try something new so he got an Alpaca sandwich with gooey melty cheese and perfectly sautéed mushrooms. I got a grilled chicken sandwich with some sort of grilled cheese which was the perfect combination of warm and almost melty but still firm, pickled onions and… a tamale! Yes, a tamale ON my sandwich! Dean said his alpaca tasted like “over cooked pork” and probably wouldn’t get that again but was glad to step out of the box and try something new. Mine was delicious. The pickled onions added the perfect fresh balance to the thick slice of cheese and tamale. We added a few Pisco Sour’s and a side of fries and it filled us for hours. Day 3 was very similar to the day before. We wandered around town and took it easy. 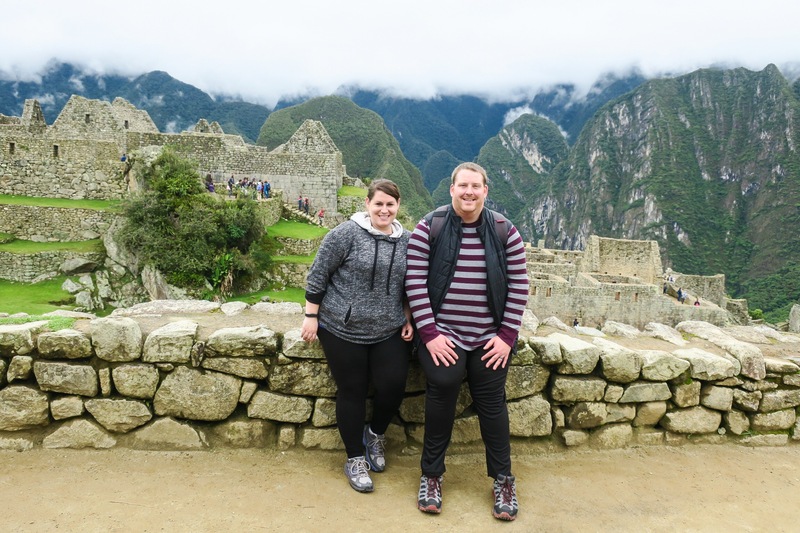 We stumbled upon a delicious Peruvian place for lunch and satisfied our cravings for the local cuisine. 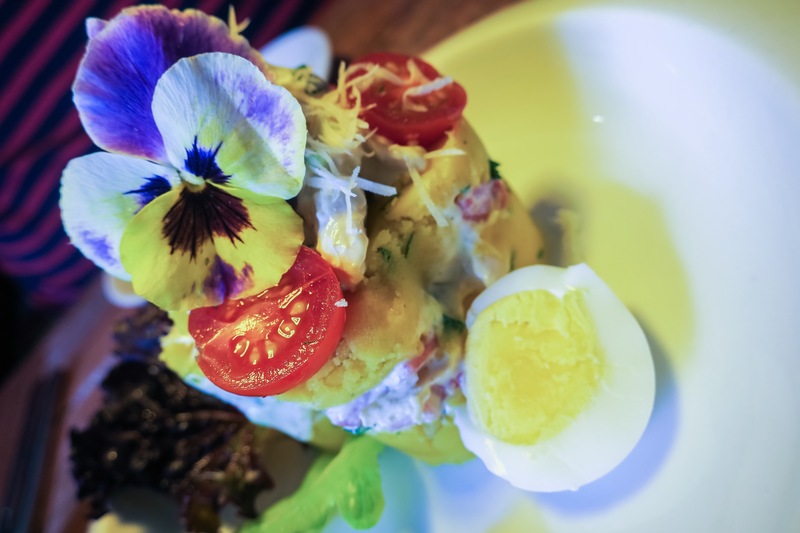 We started with Causca de Pollo which was chicken salad sandwiched between two layers of Peruvian golden mashed potatoes and a hard boiled egg on the side. It was rich and creamy without feeling too decadent and was just enough to share before our main dish. They presented it so beautifully as well! 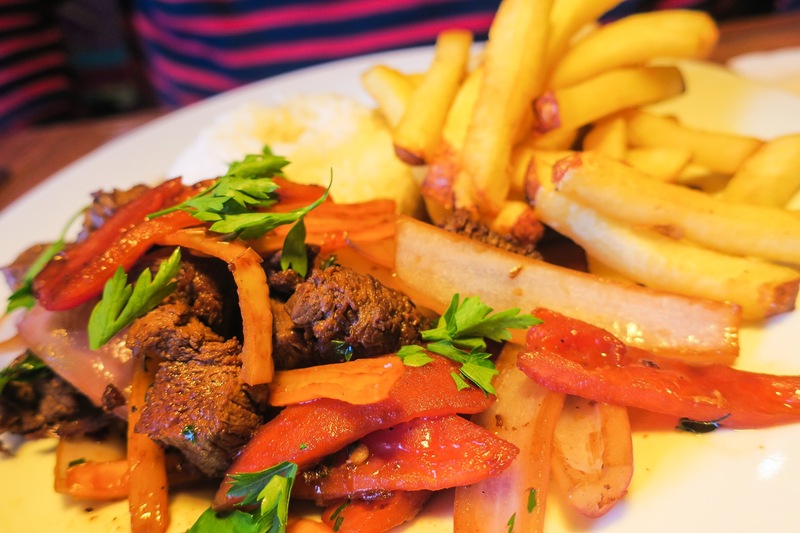 Main dishes consisted of Lomo Saltado for Dean, a stir fry of beef tenderloin, aji peppers, onions and a soy base sauce. Served with rice and French fries. (Yes, double carbs! No complaining here!) 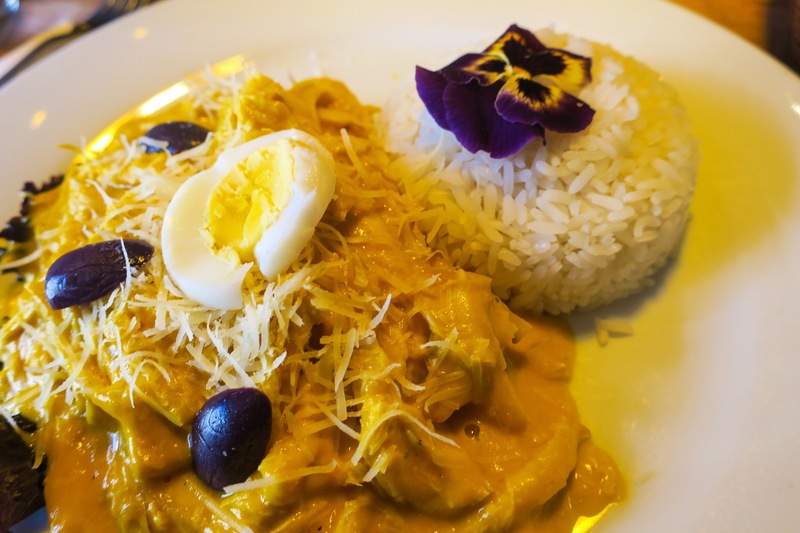 I got Aji de Gallina, shredded chicken in the famous Aji sauce. 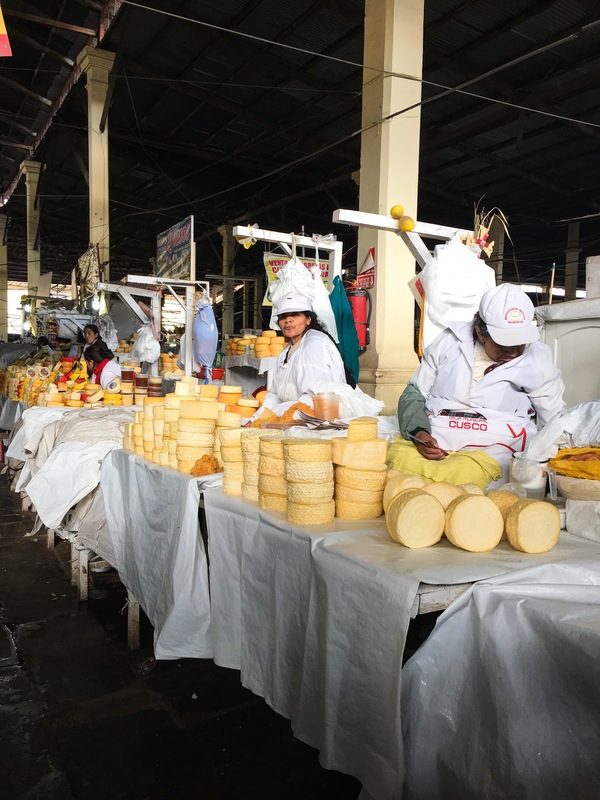 Aji amarillo is a popularly used pepper in Peru and while it is used in its natural form, it’s also commonly used to make into a creamy sauce. It can be used to dip French fries, put on sandwiches or in this case, just as a sauce. In the afternoon as we were talking around, a huge parade came down the street. 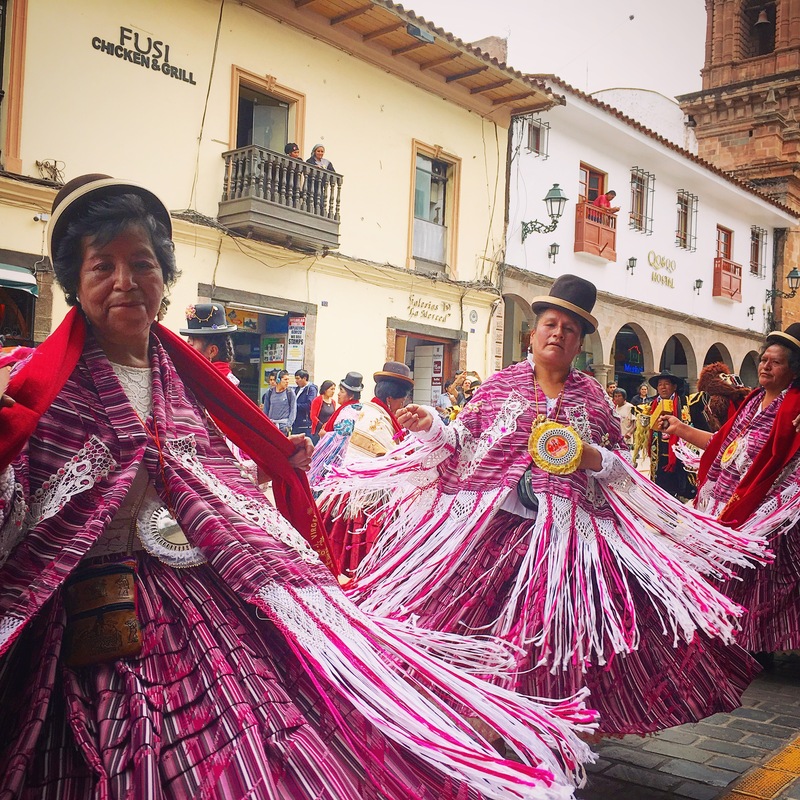 The women were dressed in huge, colorful dresses and the men were in festive suits (some dressed as monkeys as well) playing the drums to the best of the Incan music that filled the street. It was awesome to see! 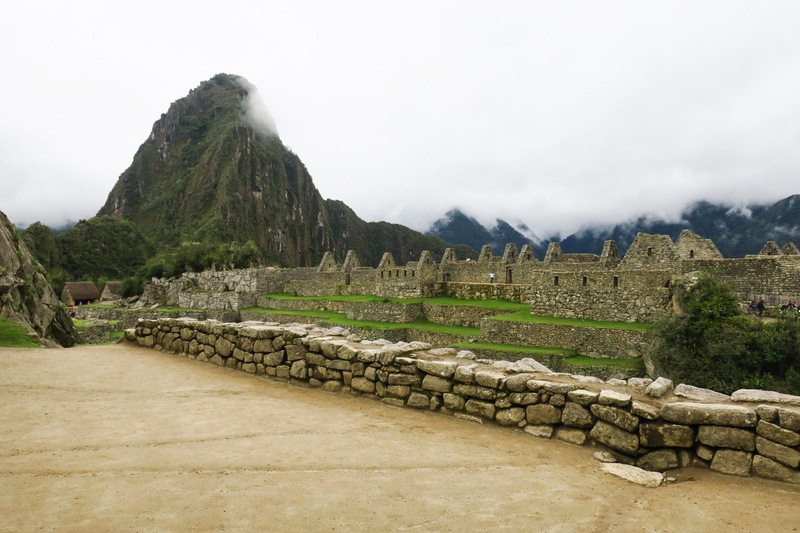 To do Machu Picchu in one day, a lot of transport is involved and it makes for a very long trek. From Cusco you have to drive an hour and a half to the Ollantaytambo train station, then take the train for another hour and a half and you will land in the town right beneath the mountain, Aguascalientes. 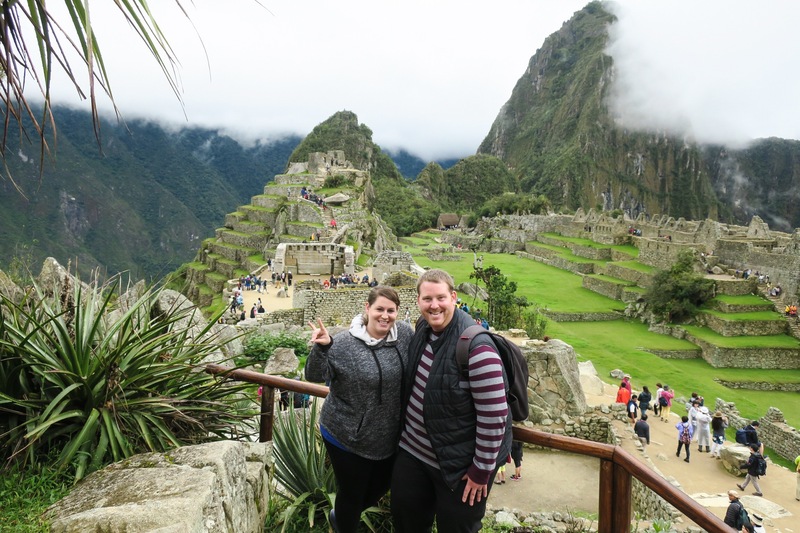 From there you take a 30 minute bus up to Machu Picchu. 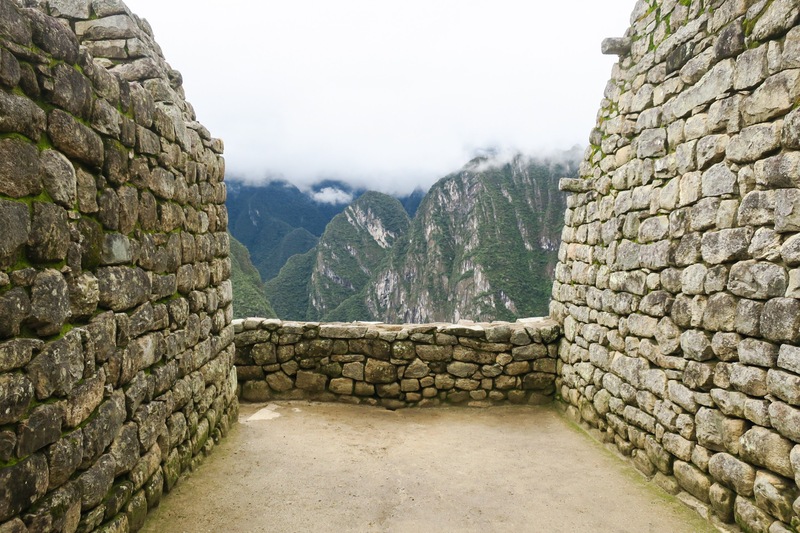 We had booked a tour online for Machu Picchu through Viator who is a third party tour company that contracts out to the local agencies. 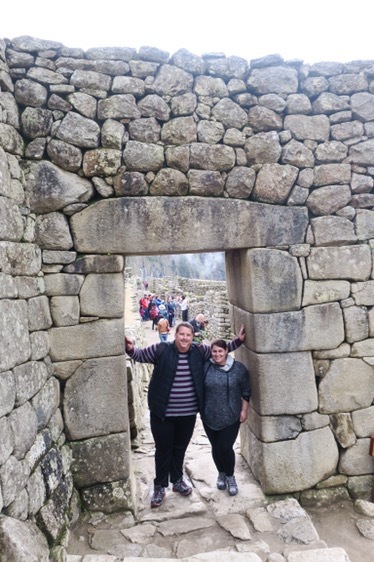 For $750 total they were to come pick us up at our hotel between 3-4am, drive us to the train station, then the train would take us to Aguascalientes where we would take the bus up to Machu Picchu, have a tour, then lunch and then back again. We had scheduled the tour for Thursday. On Wednesday we decided we would go into the town to one of the many tour companies that line the streets and schedule a local tour for Friday. 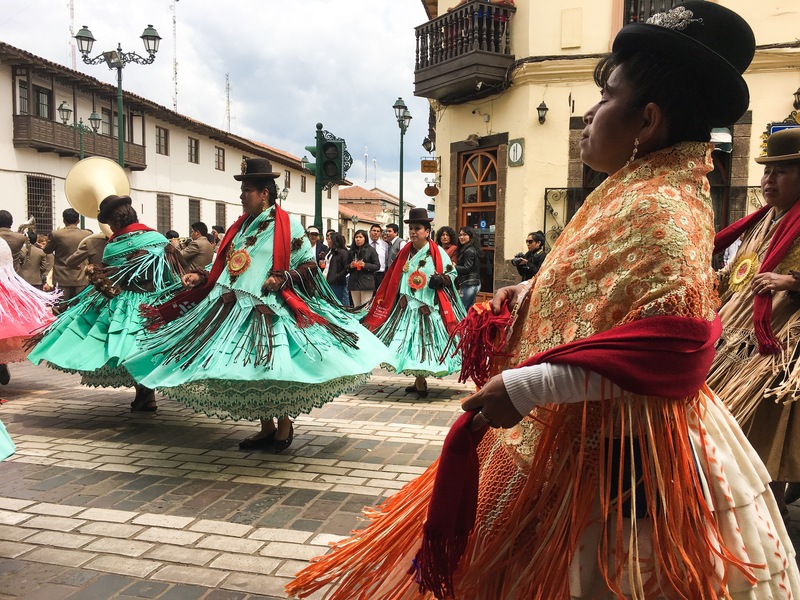 In doing so, we learned that a strike was going on and the road to the Ollantaytambo train station was closed Wednesday and Thursday. Since there is only ONE road to get there, we naturally got very concerned about our trip for the next day. We immediately called Viator to ask them what was going on and to make sure we were still on. For 8 hours we were back and forth with Viator with no answers. Initially, around 11am, they said they had gotten in contact with the local agency and they were investigating and would get back to us within 30 minutes with an answer or solution. By 8pm we still had no answers and had no idea if we were to meet someone at 3am for the trip. Viator told us to act as though we were going. So, we set out alarms for 2:30am and went to sleep. Around 1am when I randomly woke up and looked at my phone, I saw an email that the trip had been canceled. After an hour on the phone with Viator, I convinced them to rebook it for the following day, Friday, as from what we heard the strikes were to be over by then. She did, although she did not want to. The next morning, Thursday, we called again to make sure we were on for Friday. Canceled. Again. Hard to believe we had to do all the investigating and work to figure all of this out when this full service company, who deals with this kind of thing all the time never reached out to us. We immediately ran out to the local companies and are so happy we did. We got almost the same exact tour as originally planned, just without the lunch, for $600 total. Instant saving of $150. So moral of the story, while it may be a nice piece of mind to book your tour months in advance, all the tour companies seem to be readily available to get you a tour, and you’ll save lots of money! 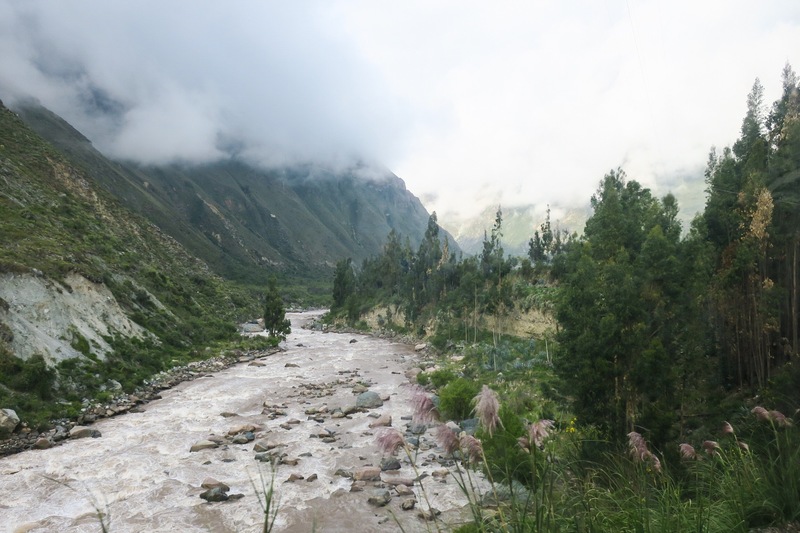 The drive to the Ollantaytambo station takes about 1.5 hours as the roads in Peru wind around and aren’t in the best shape. (Don’t sit in the back of the transport van, your insides will thank us later). Once we got to the station it was another hour and a half train ride. 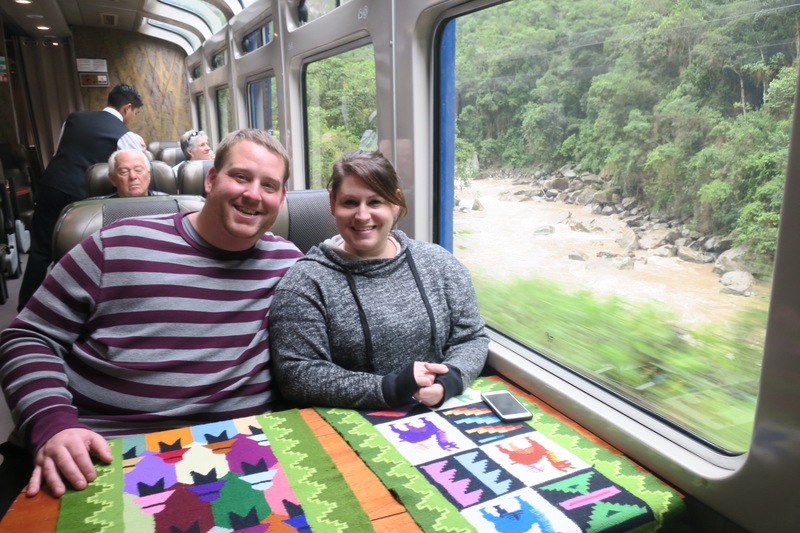 We took the vistadome train on PeruRail which is their mid level train. So happy we did! Large windows made the view incredible and the service was great as well, nice comfy seats, a morning snack with beverage service, and friendly professional staff. 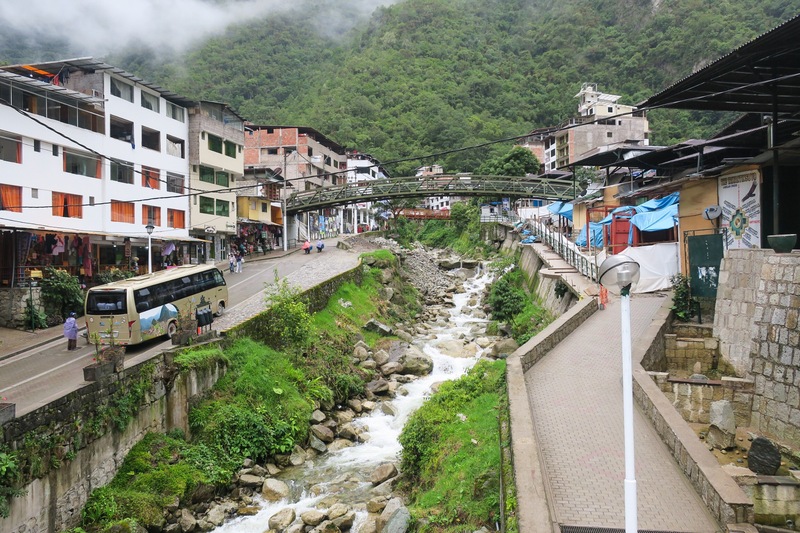 Once you get up to the main town, Aguascalientes you need to make your way to the bus up to Machu Picchu. Go through the market to the side where the river flows and take the bridge across!!!! We got lost trying to figure out which way to go. Of course. Once we got to the bus it was just about 25 minutes before we were at the entrance point where we were to meet our guide. We waited. And waited. And waited. Never came. Fortunately for us there was a guide up there, Beltran, who must do freelance tours and was able to get ahold of the company we booked through and ended up being the one who took us. I thought it was a little sketchy but he assured us he would not ask for any money and would do the full tour with us.. in English. It turned out to be fantastic! 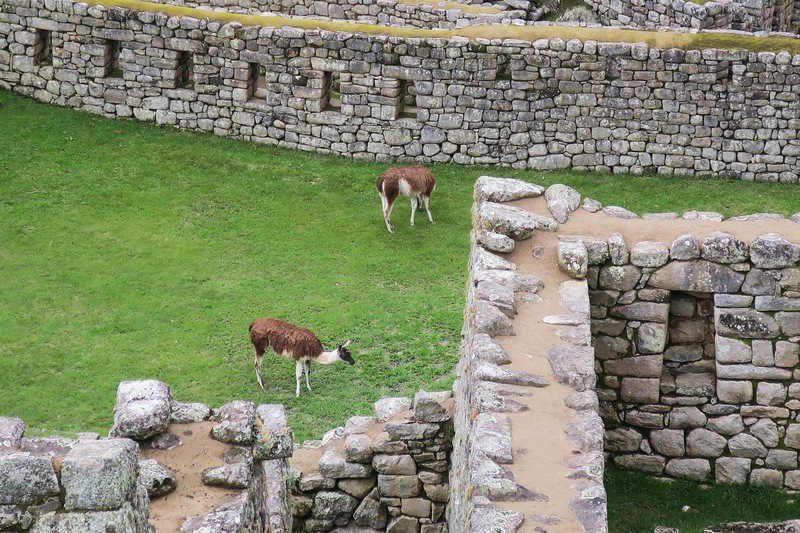 He taught us all about the Incan culture and their history as well as the history of Machu Picchu. 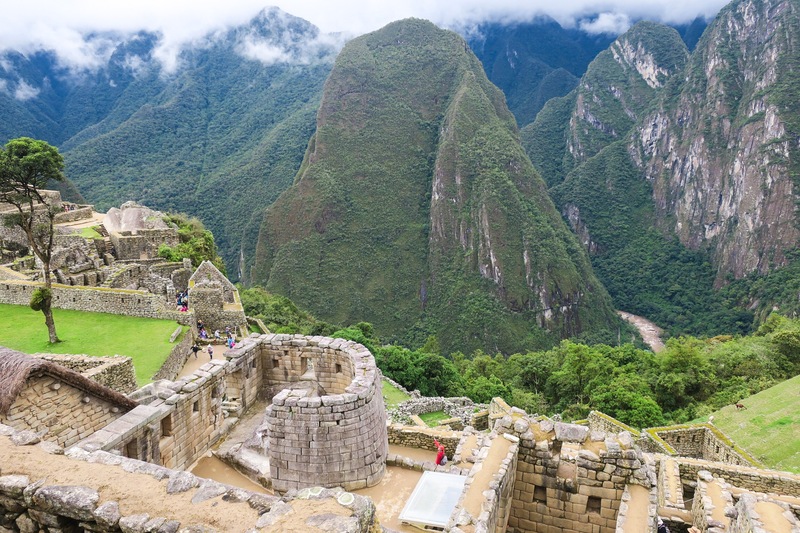 Machu Picchu and the surrounding mountains are magnificent. Humongous. Vibrantly green. 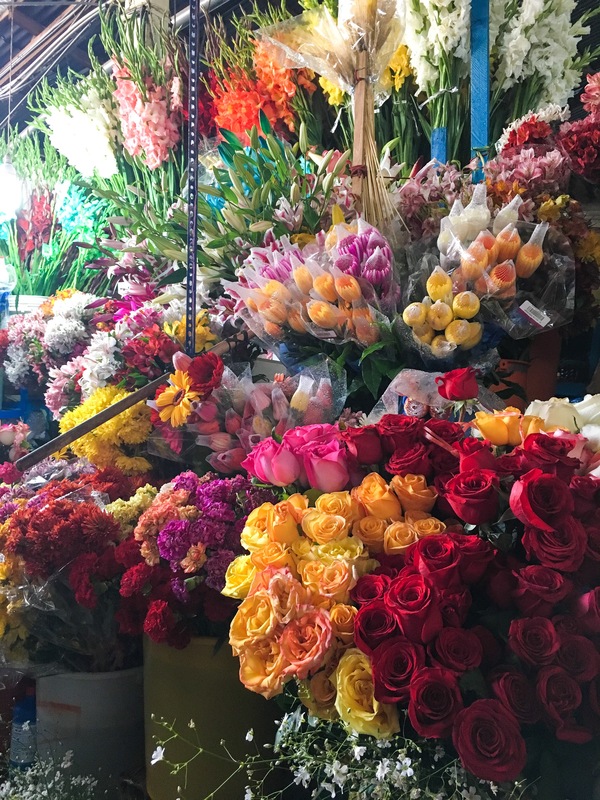 Seeing pictures, you think you know what you’re going to walk into and what you’ll see. But no, nothing can prepare you. All hiccups and issues surrounding getting to this historic place seemed insignificant. Any worries or upsets in the world seemed meaningless. Next up, birthday week for Julie full of warmth and wine in Chile! 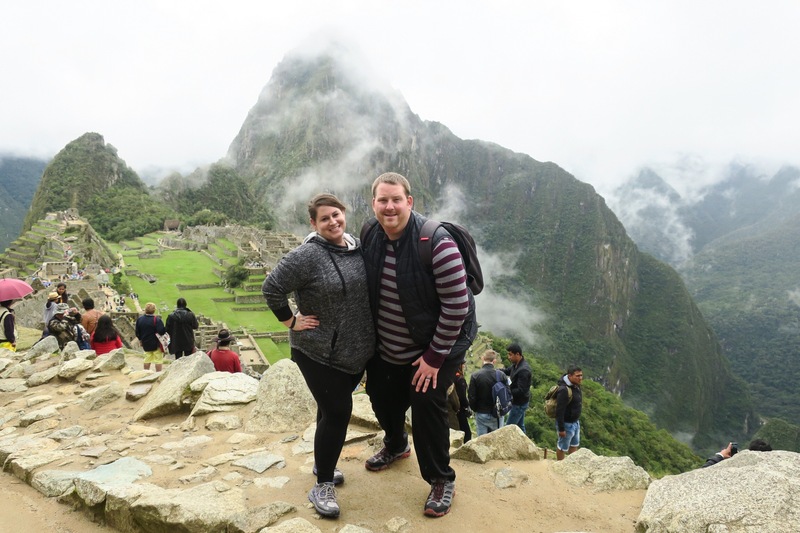 Previous PostLima, Peru: Finally South of the Equator and We Have Farmers Tans to Prove it! Thank you for posting. This was a very nice re-cap with some good information provided. Great job. I wonder if either of your got sick while you were in Peru? 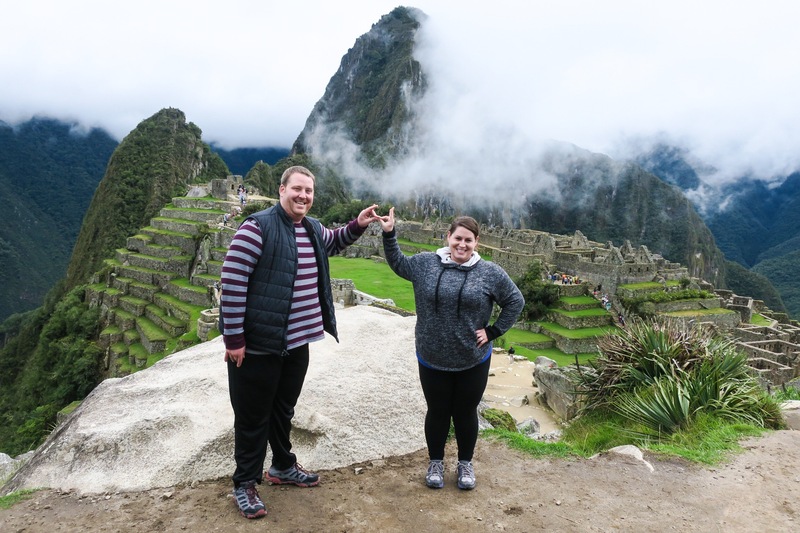 I visited Peru 7 times in 2015 and got sick five out of the seven times. 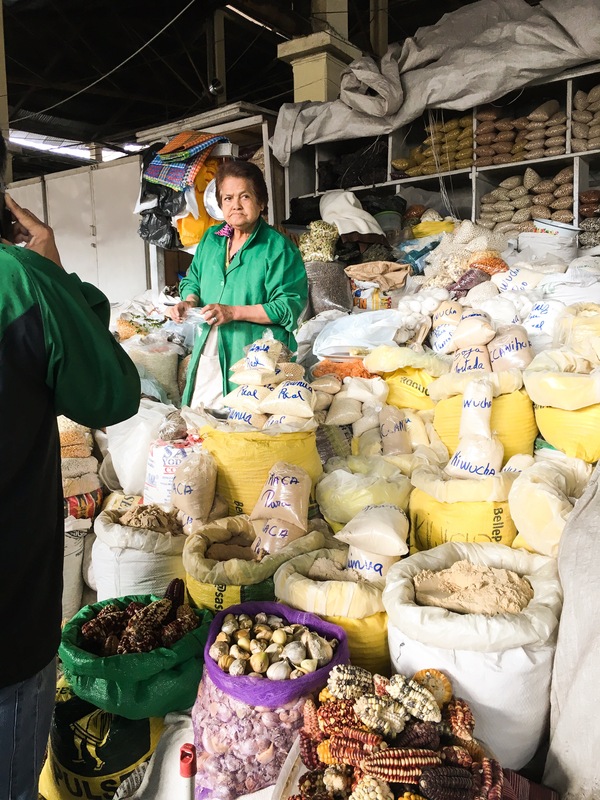 I realized there was no standards-based resource for travelers to determine which restaurants in the developing world care about food safety and which restaurants we should avoid. The big traveler review sites have no meaning when it comes to whether a traveler is likely to get sick or not in a restaurant. This is why I started Cocina Verify. We just went live in December. 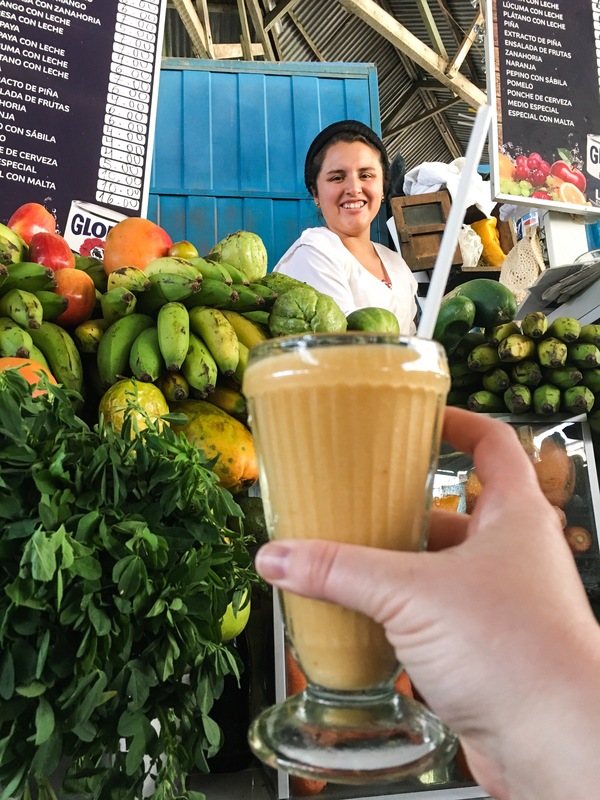 We connect travelers with the safest restaurants in Latin America and soon to be beyond. We are adding more restaurants in more countries every month. All the restaurants in our program have safe water and meet U.S. FDA and State of California food safety standards and they are inspected monthly by Cocina Verify staff and then they are inspected a minimum of two times a year by inspectors from the U.S. We are trying to provide a high degree of trust and confidence for tourists and business travelers in countries that, for one reason or another, do not have the high food safety standards that we do in the developed world. Please check out our site and let me know if you ever make it to one of our restaurants – I would love to hear about it! Keep traveling!! p.s. We have just signed our first restaurant in Cusco. Hi Allan. 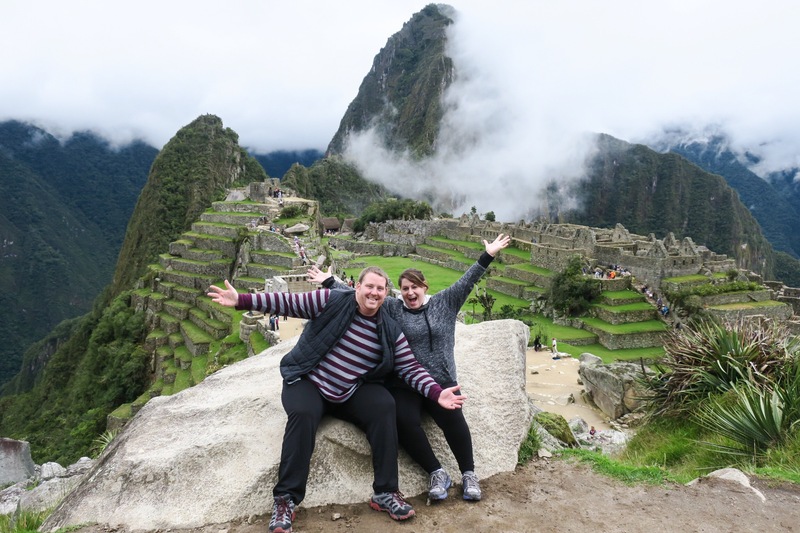 No, neither of us got sick in Peru! We are leaving South America today and are heading to New Zealand. Best of luck to you! Lovely blog of your travels, the pictures of the people, food & country side are wonderfully done. Happy Birthday Julie. Have a wonderful adventure .